Italy’s tomato industry has been accused of pushing migrants into ‘conditions of absolute exploitation’. But it also creates the very conditions that make migrants leave their countries in the first place, such as from Sub-Saharan Africa. Italy is the first producer of tomatoes in Europe and the third producer worldwide. Every year, Italy produces more than 5 million tons of tomatoes with roughly 90% of the production destined for processing and exportation, with a sec- tor turnover of more than 3.2 billion euros. The business is also lucrative for players outside Italy. In January 2012, the British company Princes, a subsidiary of Mitsubishi Corp since 1989, established a new tomato processing plant in Foggia, in the southern Apulia region. The new factory is the largest tomato-treating site in the world and one of the most high-tech and advanced in Europe. It can process up to 400,000 tons of fresh tomatoes a year and generates annual revenues of more than 200 million euros. The agricultural sector in Italy is heavily reliant on migrant workers. According to official estimates, 161,000 foreign workers (16% of the total) are regularly employed in the agricultural sector in Southern Italy and at least as many are working without having been declared. Migrant workers, many of them irregularly employed, hand-pick tomatoes for high-tech processing plants, some of them in extremely exploitative conditions, for as little as 20 euros for 12 hours per day. In reaction, the previous Italian government passed the “Legge sul Caporalato” in February 2016. The law, which criminalises employers as well as intermediaries facilitating the employment of irregular workers, is a significant step in the right direction. But a lot remains to be done – to fight the exploitation of migrants and improve their working conditions, as well as to ensure the enforcement of the law – as shown by the recent killing of a migrant worker and trade union activist from Mali in Rosarno, Calabria, in June 2018 and the two car accidents who lead to the death of 16 migrants workers in the Apulia region in August 2018. 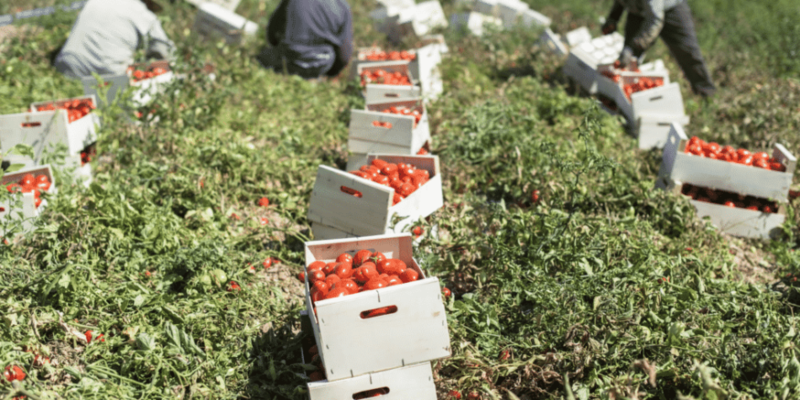 However, this is just one side of the story that connects Italy’s leading position as tomato exporter worldwide with the lives of migrants who come to work, regularly as well as irregularly, in Europe. While the majority of tomatoes harvested in Italy continues to be exported within Europe, a major destination for the tomatoes grown in the province of Foggia is the African market, particularly Ivory Coast and Ghana. In these two countries, since the early 2000s, Italian tomatoes, mainly in the form of tomato paste, have replaced local production. Over the last 15 years, the competitive- ness of Italian tomatoes has been boosted by EU subsidies which reached up to 65% of the final market price. At the same time, the EU also facilitates the export, by reimbursing up to 45 euros for every ton of exported tomato paste. Statistics are very rare but to give a sense of the scale of the phenomenon: according to the Food and Agricultural Organisation (FAO), tomato paste imports from Italy and China to West Africa has risen by 650% from 1998 to 2003. The impact has been devastating for local production in West Africa: farmers who invested in tomatoes in the 1990s were no longer able to compete with foreign products, which led them to either change sector or switch back to subsistence agriculture. Local transformation companies had to shut down, leaving many workers with few other options but to look for better opportunities elsewhere, including in Europe. The impact of the Italian tomato exportation in West Africa is just one example of the negative impact of some EU trade policies. Beyond the tomato industry, and the agricultural sector altogether, unfair trade and dumping concern many other economic sectors in several African countries. The consequences on the job markets of the involved countries are often dramatic, directly and indirectly impacting the migration aspirations of many frustrated workers. The analysis of the “root causes of migration” has become increasingly popular these days, often accompanied by proposals to boost development aid in countries of origin to reduce migration flows towards Europe. Yet, the dynamics in the tomato industry in Italy and its wider links suggest that starting to take a radically different look at EU trade policy and private investments may actually yield better results. *This article was first published in the Progressive Post Magazine on 13 September 2018, and is available here.